This piece is something I dreamed up for a client who originally requested a moon. I went far afield and came up with this design.I call it Luna, but it is more like a mermaid. I first drew the pattern in many phases: drawing, hanging it on the wall, looking at it at different times, altering lines for a better flow. Finally, I had what I wanted and traced it in Glass Eye 2000. I chose glass that would enhance the dreamy mood of the mermaid and dolphins. I love these greens and blues and jewellike accents. My client loved it and gave me $600 for it. I did another one and entered it into a juried art exhibition at the Maryland Federation of Art. 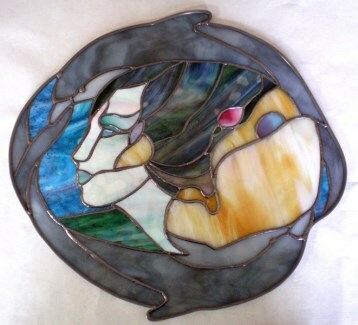 It was accepted, which thrilled me because most paint artists don't consider stained glass real art. The judge admired it greatly and said anyone who would take that much time with a work of art is insane. Yes, I admit that I am insanely in love with the art of stained glass. I did not win the exhibition, but I felt a great sense of accomplishment just to get a piece accepted into an art competition. Since then I have had two other pieces accepted. Luna is done with the copper foil and solder method, which allows for a great deal of artistic expression. Carol has been doing stained glass for about twelve years. She took her first class at The Glass Key, which was then in Jessup, Maryland. She says that Donna Darcy, the owner and instructor, is an excellent teacher and gave her a great start. Since then Carol has done over 200 pieces. She also teaches stained glass to seniors through the Sage Program at Prince George's Community College in Maryland. 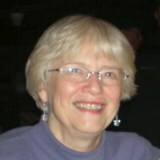 You may visit Carol's Facebook page and you may contact her via email.